Are you wondering how to get a good jazz guitar tone? 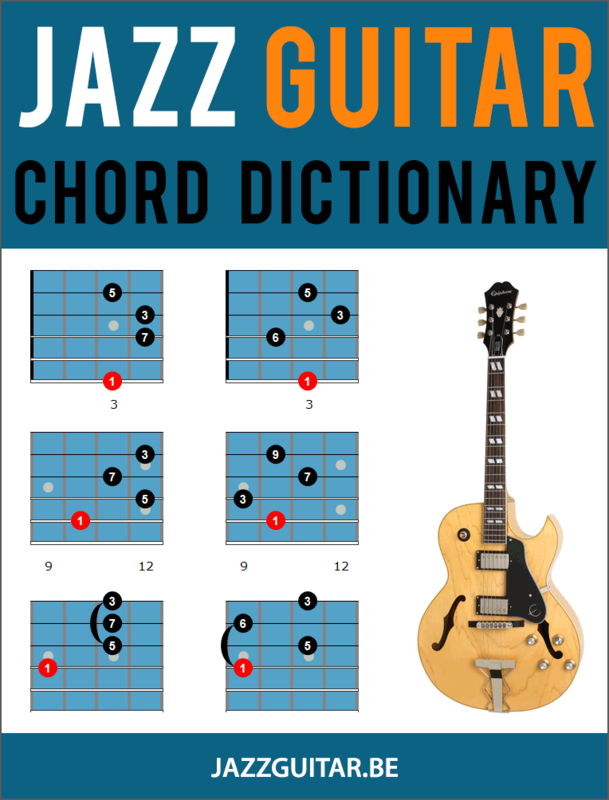 On this page, you will learn how your favorite jazz guitar player gets his unique sound, besides using his ears and fingers. Discover what kind of guitars, guitar amps, strings, picks and effects the jazz greats use. Al Di Meola is an influential guitar player who blends different musical styles such as jazz, flamenco, and rock into his recognizable fusion sound. Al Di Meola uses a sophisticated pedalboard running through his amps. Acoustically, he uses a microphone and the line from his guitar, using an RMC pickup that picks up the natural sound of his guitar and also accesses a divider into his Roland VG-88 guitar synth. The Conde family from Madrid (Spain) is a famous guitar building family. Al Di Meola uses a Conde nylon-string guitar on recordings like World Sinfonia, Winter Nights, and Elegant Gypsy. The guitar is almost 30 years old and has tremendous beauty and great sustain. Al Di Meola also has a signature model made by Felipe Conde. He had the guitar modified with a Florentine cutaway. To amplify the guitar, Al uses a Schoepps C-530 condenser microphone and an RMC piezo pickup. Paco De Lucia also plays Conde Hermanos guitars. Al Di Meola has an Ovation signature model. Most of the album Cielo e Terra is recorded with the Ovation. One thing he likes about the Ovations is that its strings do not have bridge pins, they attach at the rear of the bridge. In the studio, he records the Ovation 60% microphone and 40% direct signal. The Ovation is equipped with a MIDI pickup to use with a Roland guitar synthesizer. Al Di Meola has 2 Godin Multiac guitars: a Godin Multiac Jazz and a Godin Multiac Nylon SA model. Both guitars are MIDI equipped. The Godin Multiac Jazz has a single-cutaway chambered body and a Godin GJN1 humbucker. 1959 Gibson Les Paul Custom Ebony – This guitar, that was originally red, is featured on the cover of the Elegant Gypsy album. 1971 Gibson Les Paul Custom with DiMarzio pickups. Sigma SDR-28MLE – Al Di Meola used this guitar for the recording of his Beatles-tribute album All Your Life. Al Di Meola uses a Mesa Boogie Stiletto, a 50W, 2×12 tube amplifier. It is a loud, British-sounding guitar amplifier equipped with EL34 tubes. AHe owns a second one with 4 12-inch speakers. Al Di Meola uses a small AER acoustic amp to amplify his acoustic guitars. 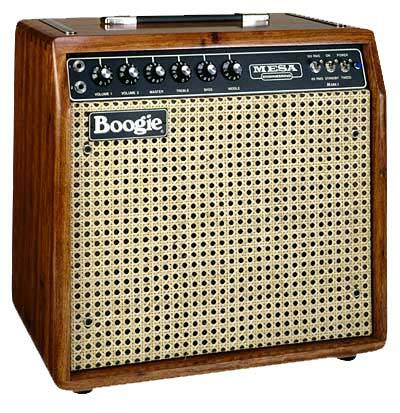 90-watt Mesa Boogie Mark V with one 12-inch speaker. Fuchs Overdrive Super 100 through a Feiten vintage 2×12 cabinet. Al Di Meola uses 3 Roland guitar synthesizers with his MIDI-equipped Ovation. The outputs of these 3 synths are connected to an Alesis multi-fx 12 channel board. 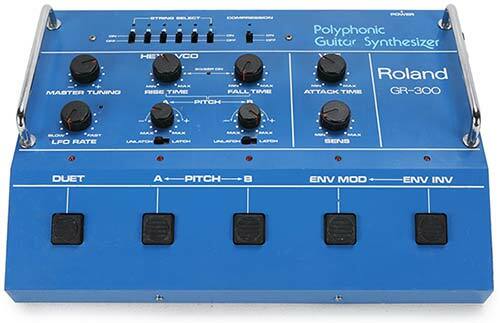 The Roland VG88 is a processing/modeling system that models some of the most popular guitars and amps in history. The Roland GR30 is a guitar synth that Al Di Meola uses to broaden his sound palette. Roland VG8 – Al Di Meola uses the VG8 to control the GR30. Al uses D’Addario EJ16 Phosphor Bronze strings on his Ovation guitars (012 to 053). His electric guitars are stringed with D’Addario EXL110 sets. On his Conde guitar, he uses Alvarez strings. Al Di Meola uses extra-heavy D’Andrea custom picks. 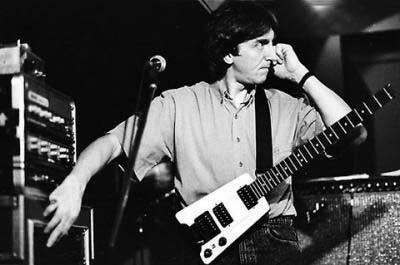 Allan Holdsworth was a British fusion jazz guitar player and composer. He’s one of the key figures of fusion jazz but doesn’t always get the recognition he deserves. In the first place, his hands. In an interview, he says that you make the sound with your hands and you can fine-tune it with your gear. His guitar rig: the guitars, amps, and effects he uses. His legato playing style, he avoids picking notes (the contrary of players like Al Di Meola). The use of the tremolo bar. A legato style of playing requires a lot of sustain. The traditional way of getting sustain is using distortion, but Allan Holdsworth never liked using distortion to get sustain. That’s when his search for the right gear started. Allan Holdsworth was a big fan of headless guitars. If you get used to playing a headless guitar, it’s really hard to go back to a headstock. I can’t really describe it, it just feels awkward. Ned Steinberger, a friend of Allan Holdsworth, is a luthier who is known for his minimalist headless guitars and basses. His most famous guitar model is the L-series guitar, made of a graphite and carbon fiber-mix. The tuners are located at the tailpiece, the strings have a ball at both ends. Another famous invention of Ned Steinberger is the Trans-Trem, a device that enables to transpose the tuning of the guitar. Ned’s company, Steinberger Sound, was bought by Gibson in 1986. Allan Holdsworth has a Steinberger signature model, the GL2TA-AH with passive Seymour Duncan SH-AH1 Humbucker pickups. Bill DeLap is a Monterey-based luthier. He has built several guitars for Allan, including a Steinberger model, a double-neck guitar, and some baritone guitars. Allan used the Steinberger Bill Delap until he hooked up with Carvin. He now switches back and forth between the two. Because Bill DeLap guitars took too long to make, Allan Holdsworth approached Carvin (now Kiesel) about making him a guitar. The result is the Carvin HF2 and HF2 Fatboy. These are the guitars he uses in the studio most of the time. Live he plays the DeLap guitars. The HF2 is semi-hollow, the Fatboy is completely hollow. Allan Holdsworth has an Ibanez signature model called the Ibanez AH-10, which he used in the 80s. 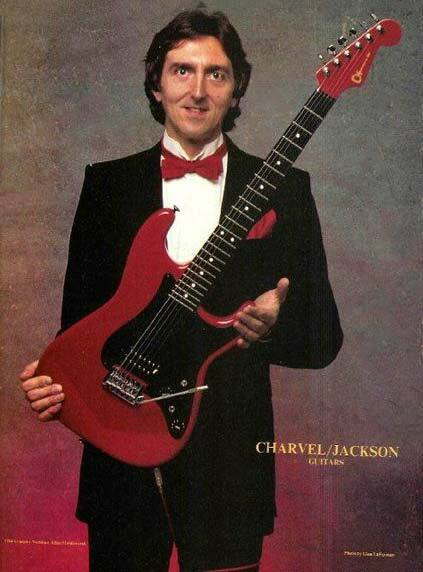 Another Allan Holdsworth signature model is the Charvel Holdsworth Original, which he also played in the 80s. Allan Holdsworth owned 3 Gibson SGs and used them for about a decade. In the 70s, he used this guitar in Tony Williams’s Lifetime band and in the band Soft Machine. 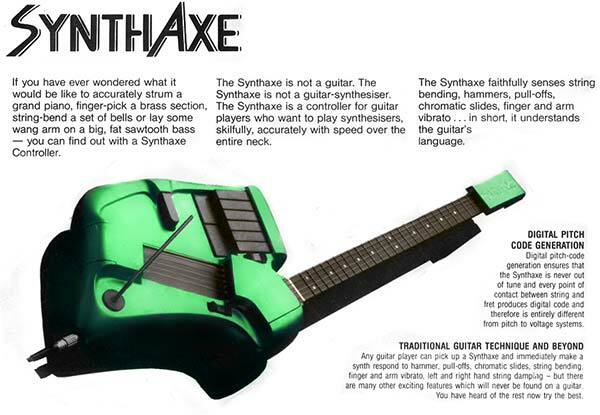 The Synthaxe was made by Bill Aitken in the 80s and is a fretted, guitar-like MIDI controller with or without a breath controller. Nowadays there are about 1000 pieces of this instrument in existence and Allan Holdsworth owned 2 of them. When this thing came along, I was just like, I’ve been waiting for this all my life. Allan used the Synthaxe on the albums Atavachron, Sand, and Secrets. 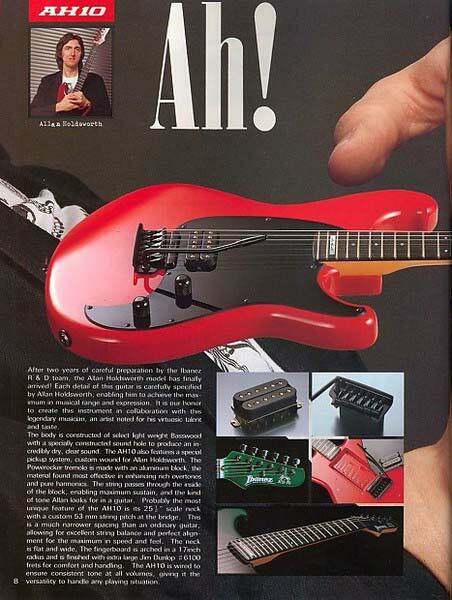 Other guitar players who used a Synthaxe: Lee Ritenour, Gary Moore, and Al Di Meola. Allan’s first guitar was a Hofner President, bought when he was 16. Allan owned a blue Fender Stratocaster in the early years, one he got from a friend and which he used it for about 6 months. Later in his career, he experimented with Strats again (with Humbucker pickups). In 1972 Allan Holdsworth recorded with a trio called Tempest, playing a Gibson ES-335. Allan experimented with a Chapman Stick (one without bass strings). Allan loved these transistor amps (made in the UK) because of their warm and clean sound. 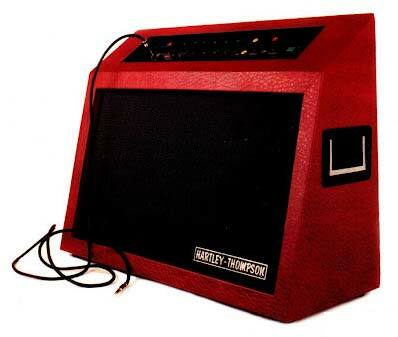 He used 2 Hartley Thompson 100w amps (later 200w) with 4 Yamaha 4×12 cabs (Yamaha and Celestion GI2 speakers). Allan Holdsworth owned 2 Yamaha DG 80-Watt digital modeling amps with Celestion Vintage 30s. One he used for his clean sound. He takes a crunch preset with very little gain and a lot of master volume. The other amp he used for his lead tone. It’s the Lead One preset with various degrees of gain. 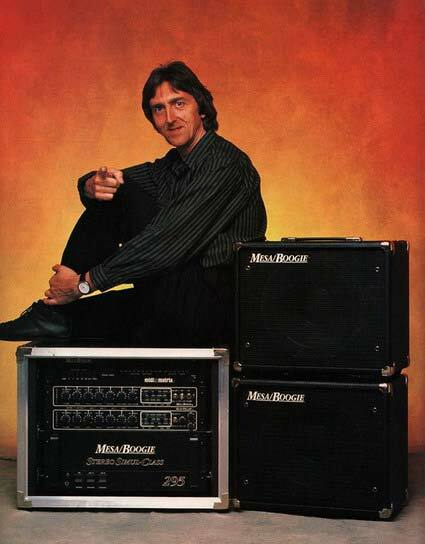 Allan Holdsworth was an endorsee for Hughes and Kettner. He used the TriAmp MKII, the Switchblade 100 Combo, a TM212 cabinet, a CC 412 A30 cabinet, and the ZenTera. In his early years Allan Holdsworth used a Vox AC30. He also played a 50-watt Marshall with 2 4×12 speaker cabinets. He liked the Marshalls for single-note soloing, but not for chords because they distorted the chords. 2 Norlin Lab Series L5, which he found too clean. 2 Yamaha P-2200s (200w), plus 2 Yamaha PGI pre-amps, and S412 speakers. 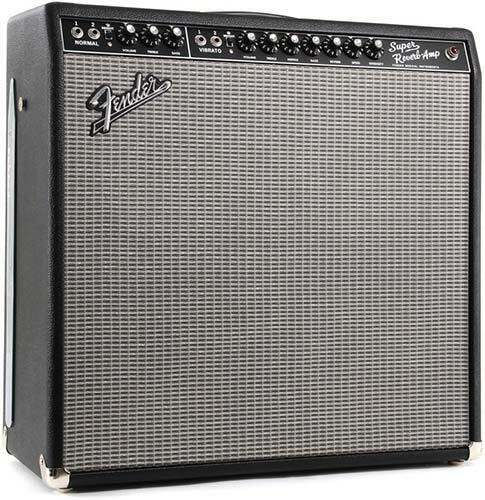 Fender Super Champ into Yamaha 200w power amp and Marshall 4×12 cabs. Allan Holdsworth approached Yamaha with the idea of putting a rack full of delays into a box. 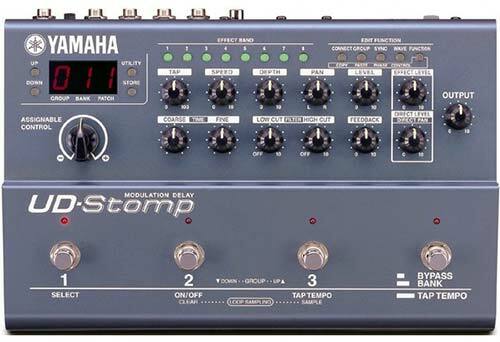 The result is the Yamaha UD Stomp. This guitar effects stompbox has eight separate delays. 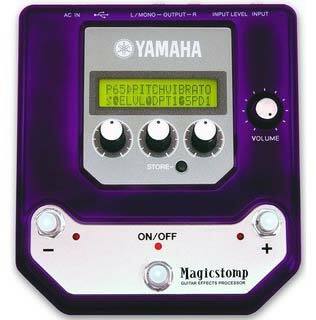 Much of the UD’s technology is later used in the Yamaha Magicstomp. Live, Allan Holdsworth uses 5 or 6 Yamaha Magicstomps, 1 clean, 1 clean chorus/delay, one for distortion and the others for effects such as pitch shifting. The Radial Switchbone sounds great! It is the best ABY box that I have used and the transformer isolation makes it easy to combine any two amps without noise. I sold the VG-8 out of desperation. But I would have liked to have kept it because it was a useful tool. I actually liked it a lot. I thought it was a really great thing. Rocktron Intelliflex – a multi-effects unit for guitar. ADA Pitchtraq – a programmable pitch transposer and harmonizer. The guitar made by Bill DeLap is stringed with a LaBella .008 set. The Carvin Fatboy is stringed with a LaBella .009 set. For recording guitar, Allan Holdsworth uses Neumann U87 microphones placed between the center and the edge of the cone. Bill Frisell experiments a lot with his guitar gear. He likes to modify his guitars and uses an enormous amount of guitar effects. Bill Frisell owns several Fender Telecasters, which he modifies heavily. Among them are a 1966, a 1969 Thinline, a 1974 Telecaster, and a Fender Telecaster Relic with Suhr pickups. He likes to experiment with different pickups, such as Lollar, Don Mare, Lindy Fralin, Tom Jones Filter’Tron, and Seymour Duncan pickups (the Antiquity model). What’s kind of seductive is that it’s all still this basic Telecaster and I can get comfortable with the scale, size, and shape of the guitar to where it feels at home, but from one to another, putting certain pickups in certain guitars, there are amazing differences. Bill plays a Telecaster that is put together by J.W. Black, with a Tele-style Mastery Bridge and Callahan pickups. Jay opened up the back of the bridge so he could add a Bigsby. Bill uses this guitar 90% of the time. Bill Frisell also owns a Rick Kelly Tele-style made out of pine from a piece of wood from Jim Jarmusch’s old loft. It’s got Lollar Charlie Christian pickups and has been used on the albums Sign of Life and The Windmills of Your Mind. Bill Frisell owns two Klein electric guitars. The one he uses the most has a chambered spruce body and a rosewood neck. The guitar has 4 pickups: a Seymour Duncan JB pickup in bridge position, a Bartolini 5J floating pickup in the middle, a Telecaster pickup at the neck and a piezo pickup in the bridge. The piezo pickup has a separate output so he can mix ‘fuzzed-out’ sound with ‘almost acoustic’ sounds. Bill uses the bridge pickup most of the time with the tone not rolled off. Bill hasn’t been playing these guitars for long and eventually stopped using them. Other guitarists that use Klein guitars: Joni Mitchell, Andy Summers, Stanley Clark, and Sting. Frisell	owns 3 guitars built by Steven Andersen. The first one was given to him by cartoonist Gary Larson (The Far Side), for whom he provided the soundtrack for a Far Side television special. He liked the guitar so much that he asked Steven to build a model 17 archtop for him and later a small model 14 archtop for on the road (nicknamed ‘Little Archie’). Joseph Yanuziello is a luthier based in Toronto. He makes these sort of oddball-like electric mandolins. His guitars are based on really cheap guitars from the late 50s or early 60s such as Harmony guitars. Other guitarists that use Yanuziello Guitars: Lee Alexander (Norah Jones) and Kevin Breit (Norah Jones). 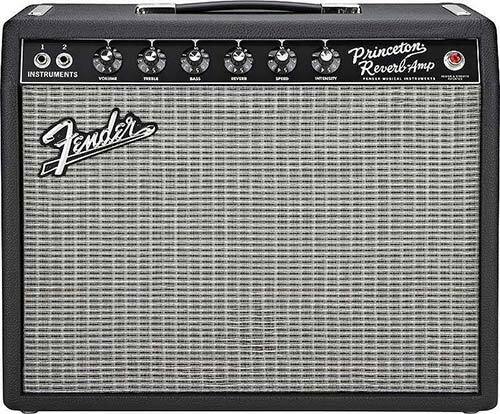 The Fender Princeton Reverb is a 22W single-channel tube/valve guitar amplifier combo designed by Paul Rivera. It is equipped with a 10-inch speaker. Bill uses this amp on his album Guitar in the Space Age. Bill Frisell owns 2 Gibson amps from the early 50s: the GA-18 and GA-50. Pictured here is the GA-50, which has 2 speakers, a 12-inch and an 8-inch. Jim Hall used the same amp. To amplify his acoustic guitars, Bill uses an external microphone. 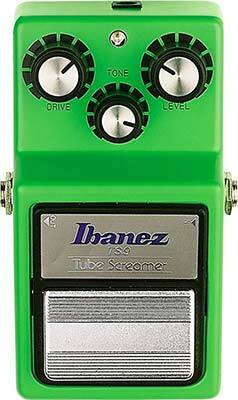 The Ibanez Tube Screamer is an overdrive/distortion pedal that allows the true sound of the guitar to come through. The most popular use of a tube screamer is to push a tube amp to make it overdrive more. 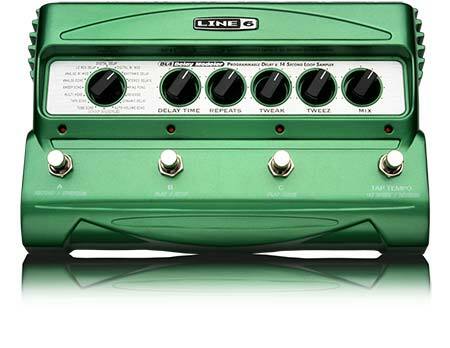 The Line 6 DL4 is a digital modeling pedal based on 15 vintage delay and echo effects. Bill uses it for loops and such. It’s having that instantaneous sustain. The Freeze instantly holds a sustained chord and I can play on top of it. 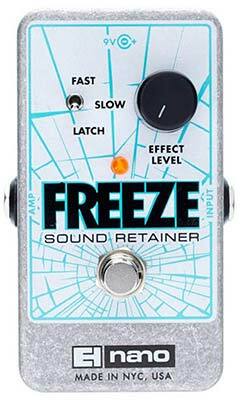 I’d been wishing I could physically play one triad, and then another triad against it—with the Freeze I can do that. Lexicon MPX-100 – Bill likes to use the reverb of this multi-fx processor until it started making noise and got replaces by the Hall of Fame. Electro-Harmonix 16-second delay – Bill owns 2 of these, but both are broken. 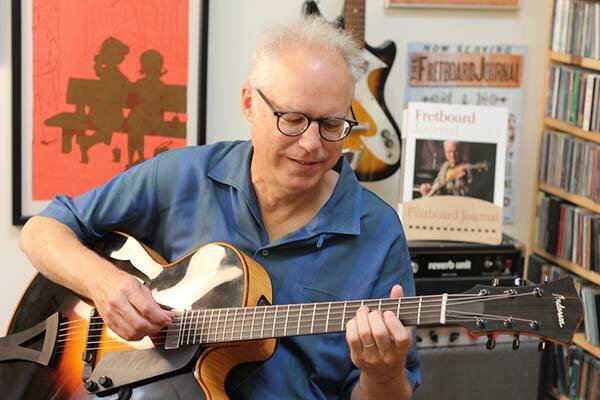 Bill Frisell uses D’Addario EXL115 strings, amongst other D’Addario sets. Bill Frisell uses Dunlop Tortex M3 Jazz Picks, and Gibson flatpicks (teardrop shaped). Charlie Christian was a key figure in the evolution of the jazz guitar. He brought the guitar out of its limited role as a timekeeper doing “chop chop chop” in the rhythm section and put it into the foreground as a solo instrument. Electric guitar and guitar amps played an important roll in this evolution. Before the era of the amplified guitar, the guitar could simply not be used as a solo instrument in the jazz bands of that time because its volume was too low. The only way a guitar could be heard was by playing chords and playing them hard. Electric guitars and amps changed all this and Charlie Christian was the first great solo guitar player with an amplified guitar. Charlie Christian started playing a Gibson ES-150 guitar in 1937. 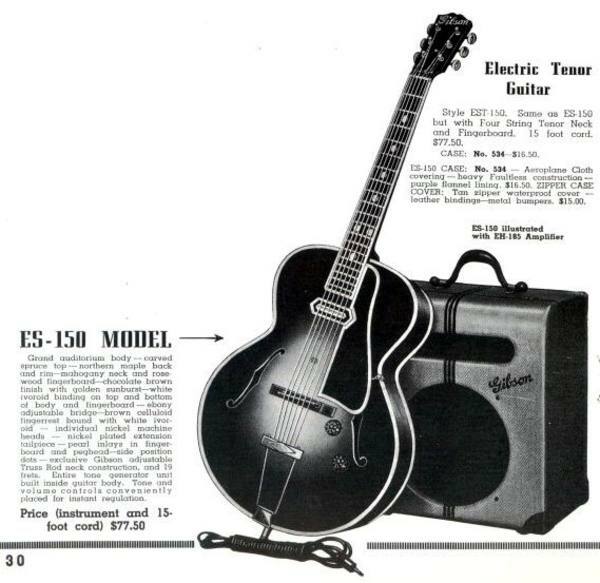 The ES-150 was the first electric guitar that had commercial success. It was introduced in 1936 and was an enormous success in the jazz bands of that time because it produced enough volume to be heard. ES: stands for Electric Spanish. 150: the guitar cost $150, EH-150 amp and a 15-foot cable included. The ES-150 has a single-coil pickup in neck-position that is known as the “Charlie Christian Pickup”. The Charlie Christian pickup was also used by T-bone Walker, Barney Kessel, Kenny Burrell, and Wes Montgomery. The ES-150 didn’t have a lot of sustain, had a bit of a muddy midrange tone and was prone to feedback when the amp was turned too loud, but this guitar was a revolution in its time. 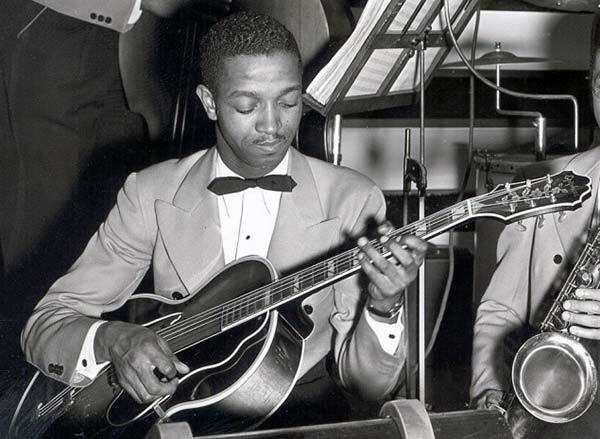 Other guitarists that played a Gibson ES-150 include Eddie Durham and Floyd Smith. 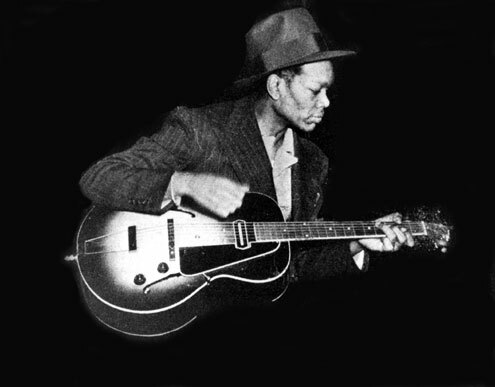 Charlie Christian started using a Gibson ES-250 in 1940 and played it until his death in March 1942. The pickup on the Gibson ES-250 was the first one to have 6 individual pole pieces, one for each string. It was played in combination with the Gibson EH-185 and EH-275 amp. 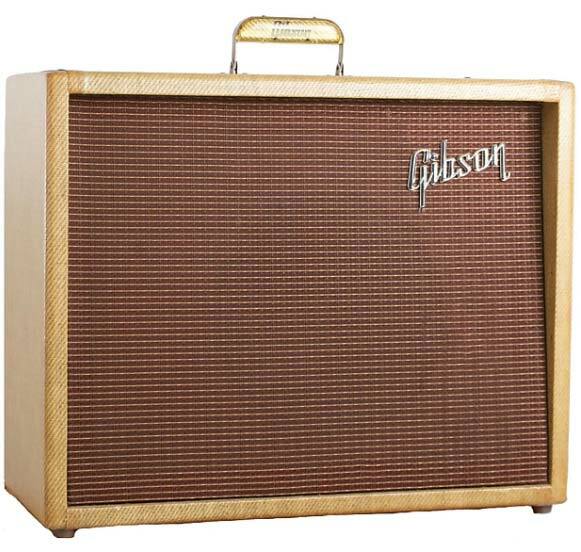 The Gibson EH-150 guitar amp came into existence before the Gibson ES-150 (it was used for lap-steel guitars). The EH-150 has a 10″ speaker (later a 12″) producing 15W. It has 1 microphone input, 3 instrument inputs, volume controls, a bass-tone expander, and an “Echo” speaker jack. Other guitarists using a Gibson EH-150 amp include Django Reinhardt and Mary Osborne. Gibson guitars at that time were shipped with heavy-gauge roundwound strings, comparable with a modern set of 13s. Guitar strings were very expensive and hard to come by and different gauges were not available. Charlie played probably 95% downstrokes and held a very stiff, big triangular pick very tightly between his thumb and first finger. He rested his 2nd, 3rd and 4th fingers on the pick-guard. He anchored them there so tensely that it was like there almost wasn’t a break in the joint. He almost never used the 4th finger of his left hand. Django Reinhardt played acoustic guitar his entire career. He played electric once, during his tour with Duke Ellington in the States, but it wasn’t a success and he never played amplified again. Django only used one brand of guitar, Selmer guitars, typical gypsy jazz instruments with an oval sound hole and a high action. Selmer produced guitars between 1932 and 1952. Although they produced a wide variety of instruments, they are particularly known for the “Modèle Jazz” (changed to “Modèle Django Reinhardt” later), made famous by Django Reinhardt. 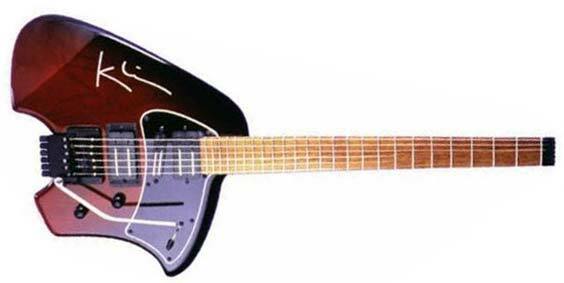 The Selmer Maccaferri was the first guitar with a cutaway and a steel reinforced neck. The guitar was initially designed by Mario Maccaferri, with a 12-fret neck and a D-shaped soundhole. When Maccaferri left the company, Selmer made some changes to the model, most notably the introduction of the oval sound hole and the lengthening of the neck to 14 frets. Django Reinhardt got an endorsement deal with Selmer, so many Selmer guitars passed his hands (he sold or gave away a lot of them). N°503 came in Django’s possession in 1940 and he played it until his death in 1952. Now the guitar is exposed in the Musée Instrumental de Paris. Selmer stopped producing guitars in 1952. Today Selmer guitars are extremely rare and very much sought-after. During the entire history of Selmer guitars, less than a thousand guitars were made. Selmer style guitars are reproduced by luthiers like Michael Dunn and John Kinnard. 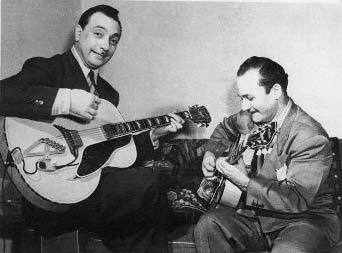 Django Reinhardt used an Epiphone Zephyr #3442 (other sources say a Gibson L5) with a DeArmond pickup hooked to an Epiphone amplifier for a short time during his tour with Duke Ellington in 1946. On that tour, he is also seen playing a 1937-1939 Levin De Luxe, a Gretsch Electromatic 400, and a Gibson ES-300. After his tour with Duke Ellington, Django never played electric again. Django Reinhardt played acoustically most of his life, but on his tour with Duke Ellington, he used an Epiphone Electar Dreadnaught. In 1946 the first guitar pickups were introduced in Europe by (later than in the United States), the Stimer P46, Stimer R46, and 2 years later, the S.T.48 pickup. Together with this last pickup came the 6-watt Livery Stimer M.6 amplifier. Django used these pickups and amp when he was playing with American musicians in Paris, such as James Moody, Don Byas, and Kenny Clarke. Django Reinhardt used very light silk-and-steel strings (.010 to .046) on his guitar. To embellish his big, smooth rhythmic sound, Freddie Green used big jazz archtops like the Epiphone Emperor and Stromberg Master 400. These totally acoustic guitars and their large body frames provided a “big”, resonant tonality and surprisingly loud volume for an unamplified guitar. Setting his strings very high, Freddie was able to produce robust rhythmic textures unprecedented in the history of jazz guitar. Of course, that setup was not user-friendly toward single-line soloing, but Green knew it was the best configuration for his specific style and approach to rhythm chords and big band guitar. Excluding his very transient excursion into amplified guitar during the late 40s, Green stayed with his tried and true format of big, acoustic archtop guitars and never wavered from it again. 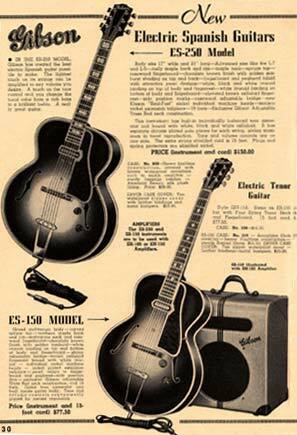 The acoustic version of the Epiphone Emperor was available since 1936, in 1951 an electric version followed. The Emperor was the most expensive Epiphone guitar and was one of the guitars kept in production after Gibson bought Epiphone. Freddie Green played a sunburst Emperor until about 1940. Epiphone stopped making the Emporer after 1957. Later other (electric) Emperor models were produced (the Joe Pass Emperor for example), but they had little to see with the original acoustic Emperor. During the 40s and 50s, Freddie Green played almost exclusively on Stromberg guitars. These 18″ to 19″ guitars were called “orchestra” models and were known for their acoustic volume, important in an era where amplification was still rare. 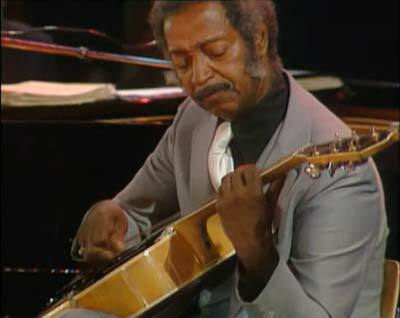 Freddie Green played a Stromberg Master 400 (blonde) and a Stromberg Master 300 (sunburst). The Master 300 has the same design and size as the Master 400, but its finishing is less detailed. The Stromberg Master 400 is very hard to find these days, and if you find one, expect to pay at least $40,000. Freddie stopped using his Stromberg Master 400 in the late 1950s when the prices of these guitars had gone up after Charles and Elmer Stromberg died in 1954. Nowadays there’s a company in Florida that sells guitars under the name of Stromberg, but they have nothing to do with the original Strombergs. Other guitarists that played Stromberg guitars: Barry Galbraith. Freddie Green made an endorsement deal with Gretsch in October 1958. For the rest of his life, he played a blonde 18″ Gretsch Eldorado non-cutaway. Gretsch Guitars built a guitar for him that he used at least well into the late 60s. Barry (Galbraith) and I went together to Birdland and the guitar sounded, frankly, terrible. About a year later the guitar sounded pretty good and two years later sounded pretty much like the old Stromberg. I think this makes a strong point that new guitars need to be broken in and that most good acoustic guitars can take on the characteristics of the player. Freddie Green’s action (string height) was set very high, in order to produce more volume. The rumor goes that you could almost put a finger between the strings and the fretboard. Freddie green always used a plectrum, reportedly standard a tortoiseshell plectrum. In one of his guitar cases, a Gibson Medium Pick was found. George Benson is a phenomenal guitar player with a very impressive guitar technique and musicality. He was the owner of Grant Green’s D’Aquisto New Yorker and Wes Montgomery’s Gibson L-5 before he auctioned them off (Pat Metheny is now the owner of the L-5). George Benson plays and endorses Ibanez guitars. I have both the tone and volume controls of the guitar all the way up. Something happens to the tone when I back up off the volume—I like to feel the bite of the guitar. You know, feel all the openness. The Gibson Johnny Smith model was produced between 1961 and 1981. It is the guitar George Benson used to record the album Breezin’, which launched him commercially. George Benson bought his 1958 sunburst D’Angelico New Yorker (serial number 2049) for $1000 in 1968. It was equipped with a Gibson Johny Smith pickup. Benson used the D’Angelico to record Body Talk, Bad Benson, and Live At Carnegie Hall. I only take the D’Angelico out on special occasions. I got a lot of my hit records with that guitar. The Ibanez GB10 is one of George Benson’s signature guitars and it was one of the first signature models produced by Ibanez. Ibanez started making these guitars in 1977 and they are still produced today. The Gibson GB10 is made in Japan, while the GB10JS from the 90s are made in Korea. I don’t like feedback, and I don’t like thin sounds. I want a full sound but I don’t want to worry about muting the strings because they’re feeding back. My GB10 is unique because it has a smaller body, which takes care of a lot of the feedback issues. Here are some of the other guitars in George Benson’s collection. A lot of them were auctioned by him in 2017 (Heritage Auctions). Epiphone Emperor – George Benson’s first guitar. 1960 Gibson Les Paul – George Benson used a Gibson Les Paul with a Bigsby during his tour with the Jack McDuff Quartet in the 60s. Gibson L-5 CES EB – The guitar of jazz legend Wes Montgomery, now owned by Pat Metheny. 1989 Gibson Chet Atkins Country Gentleman Orange – This guitar was given to him by Chet Atkins. 1980 D’Aquisto Sunburst Excel Archtop Electric Guitar. Guild X-175 – Featured on the cover of The Other Side of Abey Road. Guild George Benson Custom – Based on the George Barnes Acousti-Lectric. Other signature guitars besides the GB10 – Ibanez GB10SE, GB12, GB15, GB20, GB100, GB200, LGB30, LGB300. Ibanez 2470 Model – A Gibson Johnny Smith knockoff. Polytone is one of my favorite sounds for guitar and works great in the studio. I found that, in big places, it wasn’t fast enough. It didn’t give me instant sound. George Benson used two 1965 Fender Twin Reverbs before his endorsement with Fender. Later a signature model Fender GB George Benson Twin Reverb model was designed according to Benson’s specifications. 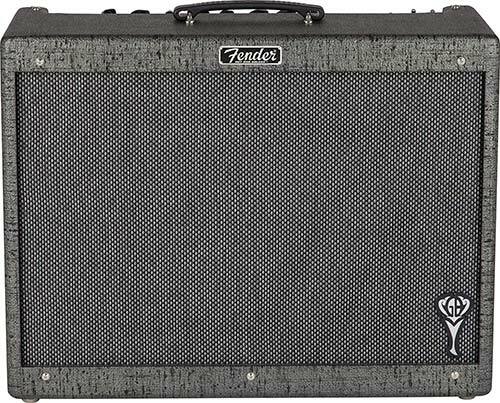 After the Twin, Fender designed another signature amp for George Benson, the Fender George Benson Hot Rod Deluxe. 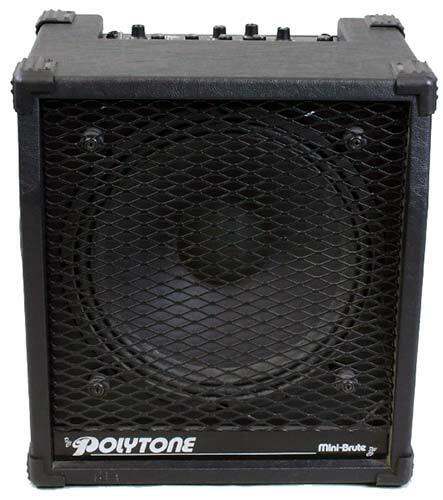 This 40-watt, 1×12 combo has a 100-watt Jensen® C12K speaker. George Benson uses Thomastik GB112 Medium Light George Benson Custom Flatwound Strings. If I’m on the road, I like to use .012s. If I’m recording, I like to use .014s. I can hear more and dig in more with the .014s. On the road, I can’t really hear all that because it goes past me and out into the audience. 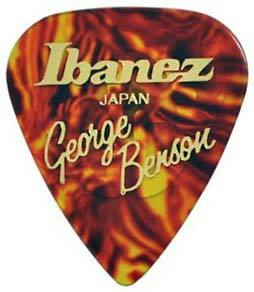 George Benson uses Ibanez George Benson medium picks. 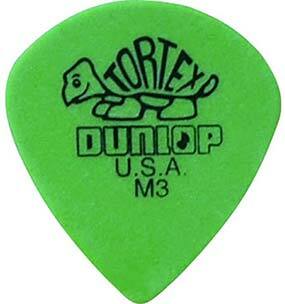 Before he used Dunlop medium picks. I use medium picks. They’re not too stiff and they allow me to have better rhythm. The two edges come down to a point that’s straighter than on a Fender pick. I do that because it gives me much more snap when the pick comes off the string. Gabor Szabo was a Hungarian guitarist who mixed jazz, rock, and Hungarian music. He studied at Berklee at the end of the ’50s. Gypsy Queen, a song from Gabor’s debut album, later became a hit for Carlos Santana. Gabor Szabo played 2 Martin Dreadnought guitars, the D-45 and the D-285. The D-45 is built with the finest tonewoods and is one of the most decorated Martin guitars (More then 900 pieces of pearl are used on each guitar). The D-45 is pretty pricey, they go from $7000 to $40000. 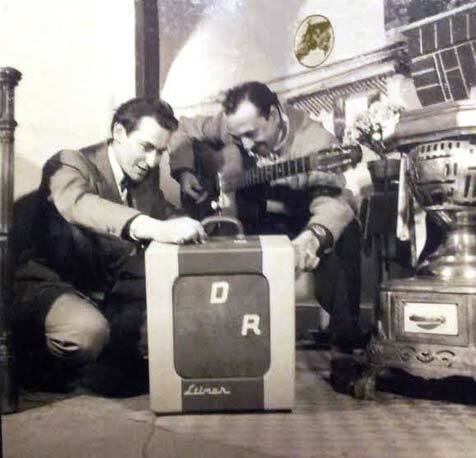 Gabor used a DeArmond model #210 pickup in his D-45. Other guitarists that use the D-45: Stephen Stills, David Crosby, Hank Williams, and Peter Frampton. 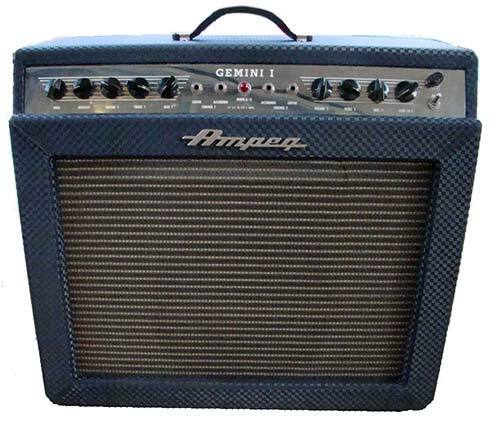 The famous 100-watt guitar amp with two 12-inch speakers. Toby Circular (A Texas-made guitar amp). Gabor Szabo’s favorite guitar picks were medium-gauge Gibson picks (called “The Star Pick” in the ’60s), made of celluloid. He played with the round side of the pick. Gabor used Gibson mono strings gauge 013 to 056 with a wounded g-string. Grant Green’s guitar tone and playing are very recognizable. His sound, which is produced by a very basic setup, can be described as natural, unpolished, silky, and rich. 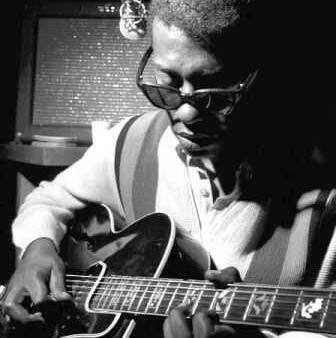 Grant Green played a Gibson ES-330 until the mid-1960s. This thinline, double-cutaway guitar has the body lines of the ES-335 and a rim depth of just around 1 3/4 inches. The guitar had P-90s (single coil elements) instead of the Humbuckers of the more popular ES-335 model. This guitar is used on the recordings of Green Street and Matador. Later, Grant Green played a Gibson L7 with a pickguard Gibson McCarty pickup. This guitar was used for the recording of the Idle Moments album. Grant Green’s Epiphone Emperor had the same Gibson McCarty pickup as his Gibson L7. From 1972 on, Grant Green started playing on a custom built D’Aquisto New Yorker with a tobacco sunburst finish. On the fingerboard is an inlay of Grant’s name in mother of pearl. According to his son, he loved the guitar so much that he would spend days without putting it down. Grant said the D’Aquisto plays easier and sounds better than any guitar he has ever had. The neck shape and size is just right for him, allowing smooth playing. He also describes the tone as funky and pretty at the same time. After Grant Green’s death, the guitar was acquired by George Benson. It belonged to his collection for many years, until he sold it to guitar builder Rudy Pensa, who sold it in his shop. Pinpointing the amps that Grant Green used to play isn’t easy because jazz guitarists of his time used the amps that were available on the gig or in the studio. Grant Green recorded on a Fender Tweed Deluxe because it was available in Rudy Van Gelder’s Blue Note Studio in Englewood, New Jersey, where many classic jazz albums have been recorded. Grant Green has been known to record on an Ampeg Gemini model, which was also available at Van Gelder’s studio. Gibson LP-12 from the late 1960s. 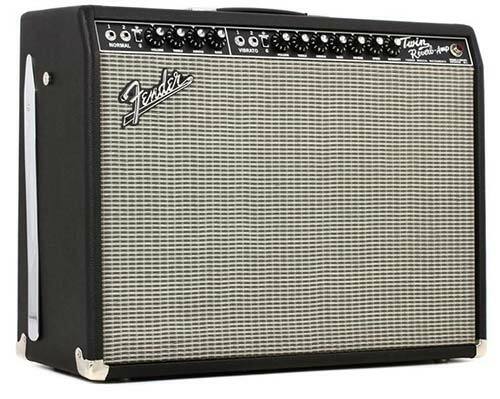 Fender Super Reverb or Twin Reverb. Grant Green used heavy-gauge flatwound strings 14 thru 58. Grant Green used heavy guitar picks. 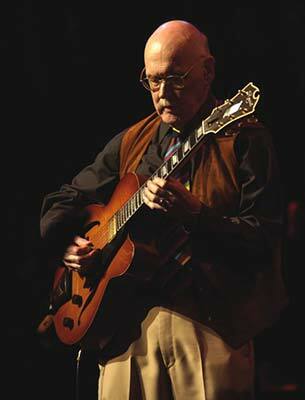 Jim Hall’s guitar sound is often described as intimate, warm, mellow, and rich. He wasn’t very interested in guitar gear and had a simple approach towards his instruments. Jim Hall bought his Gibson ES-175 second-hand in 1956 from studio guitarist Howard Roberts. I love that guitar, even though sometimes I don’t touch it for months. It’s easy to tune and after having been schlepped around and played for so many years, it’s as if it knows just what to do. The guitar originally had a single P90 pickup, but Jim later replaced it with a humbucker. Jim plays it with the tone-knob rolled back. Other guitarists that play a Gibson ES 175: Pat Metheny, Herb Ellis, Kenny Burrell, Derek Bailey, Joe Pass, and Wes Montgomery in the early days. Jim Hall owns two guitars that are handmade by the late luthier Jimmy D’Aquisto. The electric one is built specifically for him. It’s a hollow body guitar with an orange top. Jimmy used Hall’s Gibson as a starting point to build this guitar. The acoustic guitar is the Avant-Garde model. Roger Sadowky has been servicing Jim Hall’s D’Aquisto guitars for more than 15 years. He got the idea of building a guitar based on Jim’s D’Aquisto. After 4 years of prototyping, the guitar got approved by Jim, and the Sadowsky Jim Hall signature model was born. The prototypes of the guitar were refined by reducing the thickness of the top and back. The depth of the body was also reduced to minimize feedback and the neck is shaped to Jim Hall’s specifications. Gibson Les Paul Custom – Jim Hall used this guitar in the beginning of his career, when he was playing with Chico Hamilton. 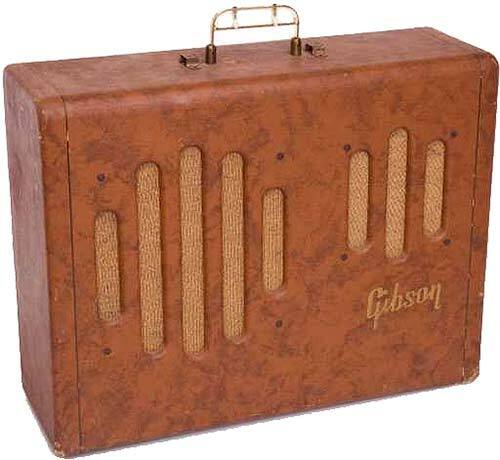 This Gibson GA-50 tube amp has 2 speakers, a 12 inch and an 8 inch. I used a Gibson, I actually remember the number, it was a GA-50. I love the sound of tube amps in general. I don’t know, I may have been able to get used to a Fender but there was something about the subtlety of that amp that I liked. I liked the way it looked, like an old radio. Jim used this amp for several years, but it eventually became too fragile to take on the road. Since then he’s been trying to get as close to the sound of the GA-50 as possible. Jim Hall owns a couple of Polytone Mini-Brute amps and uses them at local gigs. Polytone is a company started in 1968 by Tommy Gumina, a jazz performer himself. Other guitar players using polytone amps: Herb Ellis, Joe Pass, and George Benson. Harry Kolbe GP-1 pre-amp and speaker cabinet. Whatever a concert promoter gives him. Jim Hall has been known to use a Boss Chorus pedal and a Digitech Whammy pedal, but not often. 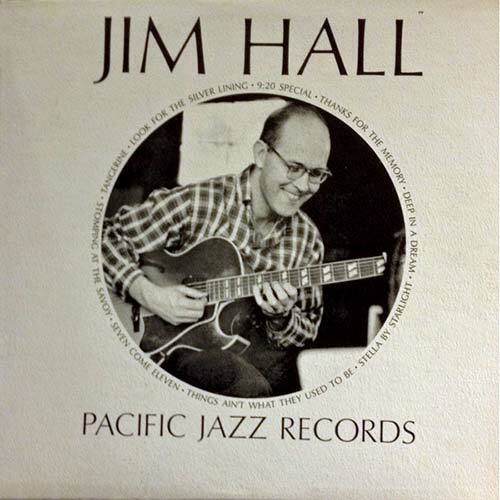 Jim Hall plays light-gauge, flatwound D’Aquisto guitar strings. The top string is .011 and the bottom is .050 or perhaps a little heavier. I usually use a .022 for the third string, but I also use an unwound .019 so that I can bend it a bit to sound like a horn. I guess thick strings can get a big sound, but they also tend to sound “bangy”. I use very thin strings, almost like a “rocker”, and try to draw the sound out by playing easily with as few pick-strokes as possible except for accents, etc. More recently Jim Hall has been endorsing Sadowsky flatwounds 11-50 with a .018 plain G-string. Jim Hall used picks with varied thickness, depending on what he was playing. For rhythmic parts, he would use a thin pick. To play melodies, he used a medium pick, and for ballads, he used heavey picks. Joe Pass is regarded as one of the best jazz guitarists that ever lived. He has a very pure, acoustic-type guitar sound. Not everyone is a fan of this sound though, sometimes it is described as brittle and too bright. Joe Pass used to play a Fender Jazzmaster during his stay at the Synanon Center in California, where he tried to kick drugs. There are also pictures of him playing a Fender Jaguar. 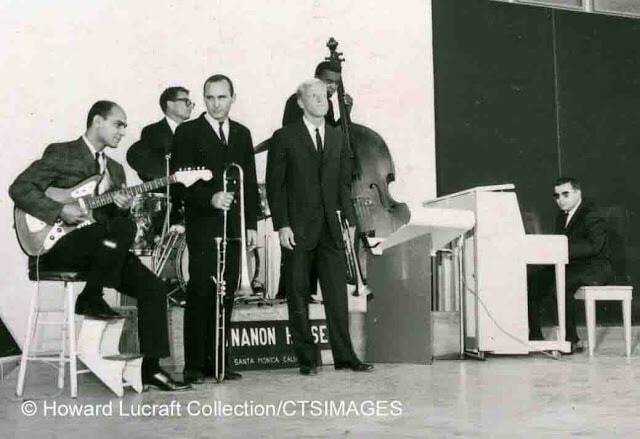 After 15 months in Synanon Joe Pass recorded Sounds of Synanon in 1961 together with Arnold Ross, another Synanon resident. During his stay Joe Pass didn’t have a guitar of his own, he used this Fender guitar that was owned by the Synanon Rehab Facility. The Fender Jazzmaster was first introduced in 1958 and was originally marketed at jazz guitarists. However, The Jazzmaster wasn’t embraced by the jazz musicians, but it became popular amongst surf rock guitarists. In the picture below, Joe Pass is playing a Fender Jaguar, recognizable by the single-coil pickups. The Fender Jazzmaster has wide “soapbar” pickups. This Gibson guitar, the ES-175, was the main guitar of Joe Pass. He got one for his birthday from a guy named Mike Peak in 1963, who saw Joe Pass playing jazz on a solid body (the Fender Jazzmaster). Other jazz guitarists who played the Gibson ES-175 include Jim Hall, Pat Metheny, Wes Montgomery (in the early days), and Kenny Burrell. In 1970 Joe Pass started playing a D’Aquisto guitar. The guitar had one pickup and was built specifically for Joe. A good example of the D’Aquisto at work is Two For The Road, a duo album with Herb Ellis. From 1980-90 Joe Pass was under contract with Ibanez and they made him a signature model based on his D’Aquisto. It is said that Joe didn’t really like his Ibanez signature guitar and he didn’t perform on it that much. Most accounts from people in the United States from this time period have Joe playing the D’Aquisto, but many reports from other countries say Joe played the Ibanez. The speculation is that Joe played the Ibanez rather than travel internationally with his D’Aquisto. The Ibanez JP20 was discontinued in 1991 and suffers a reputation for a thin tone due to its pickup placement (too much in the middle, not close enough to the neck). 1901 Martin 00-42 – Joe played this guitar when he was young. Joe Pass used a Polytone Mini-Brute amp, a compact solid state amp with 110 watts going through a 12″ speaker. Other jazz guitarists using this amp include Jim Hall, Herb Ellis, and George Benson. 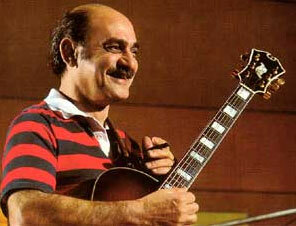 Joe Pass used D’Aquisto Flatwound Strings with a 013 to 056 gauge. Joe Pass used a medium thin gauge pick, not soft, but firm. In an interview, he says he always uses the same kind of pick, broken in two. John Scofield’s favorite guitar is the Ibanez AS200, which he has been playing close to 4 decades. He experiments a lot with his sound, adding new guitar effects to his extensive pedalboard regularly. John Scofield made this Gibson ES335-copy famous. It has been his main guitar since 1981 and has played it for over 3 decades. The Ibanez AS200 is the longest running guitar model in Ibanez history. According to John Scofield, the original Ibanez AS200 guitars from the early 80s were some of the best semi-acoustic electric guitars ever made. It’s a very well made instrument and really balanced in tone from the highs to the lows. He uses the treble element with the highs rolled off. That’s when Ibanez brought me this brand-new AS-200 to try, and I said, “Man, this plays great and feels great … it feels a lot like my 335.” I began playing it on that tour. When I got home, I had the Gibson adjusted, but I’d been playing the Ibanez for a month and was used to it… and I’ve been playing it ever since. I actually have two Ibanez AS-200s, two old ones. I changed the pickups on one of them and put some Voodoo Humbuckers on. But the main one I play still has the original pickups, which are, like, the loudest pickups known to man. John’s signature guitars, the Ibanez JSM100 and JSM200, are based on the Ibanez As200. The JSM100 has a Prestige neck, a side output jack, and Super 58 pickups. This Gibson ES-335 is featured on the album cover of the album Who’s Who?. 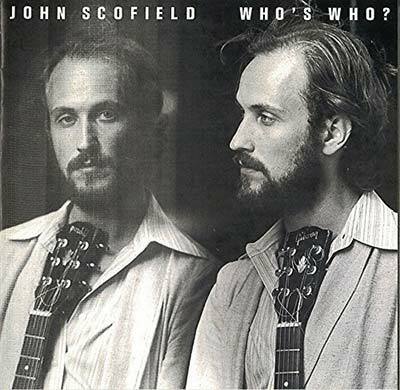 John Scofield’s first guitar was a Fender Telecaster. A few years ago, I was contacted by a guy who had my high-school guitar – a ’66 Tele that I bought new at Manny’s on 48th Street in New York. I sold it in ’68 to buy a Les Paul. The guy I sold it to gave it to another guy in Connecticut, who kept it all those years before moving to Texas. He came to a show I was doing in Austin a few years ago, and I played it. It was in good shape – had the same case and everything. I remembered the dents I put in that case. He asked if I wanted to buy it, but wanted a lot of money. I told him I’d just buy a new Tele, and I did, from Fender’s Custom Shop. Well, last year, the guy got back to me and made another offer. I couldn’t refuse, because it’s got such sentimental value. So I bought my first guitar – I own it again! I had it set up, and it sounds killer! It’s a fake vintage, from the Custom Shop. I told a friend of mine, Artie Smith, who is one of the great guitar guys in New York, that I wanted to get a Strat, but didn’t want to spend 15 grand on a vintage one. He said there was a good one at Sam Ash, so I went up there and played it for a while. I was totally embarrassed to buy it because it has a fake cigarette burn in it and screws that have been rusted and two kinds of rubbed-off finish. But you know, it sounds really good and it’s a great guitar. This nylon string flamenco guitar is specially designed by George Katechis Montalvo for Scofield’s album Quiet. Ibanez Custom Shop George Benson Signature Model. This is the guitar featured on the cover of Flat Out. Ibanez Artist AR-350. This is the guitar pictured on the cover of Still Warm. Small-body 1941 Martin guitar (used on Groove Elation and I Can See Your House From Here). Takamine NP 65C (currently known as the P3FCN), Scofield’s nylon-string guitar of choice. John Scofield uses the old Vox AC30 models as well as the re-issues until 2006. One of them is a reissue from the late Nineties that hr modded, changing one of the speakers. He likes the natural distortion of the AC30. 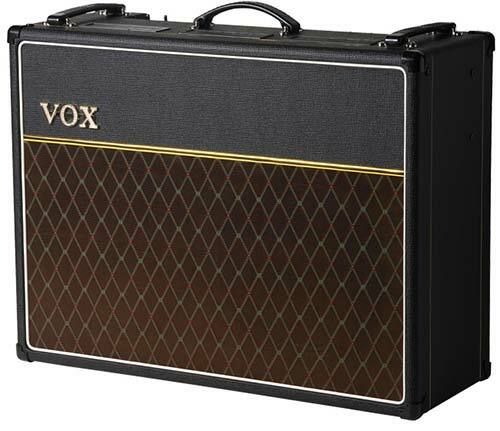 Well I like Vox AC30s, and I always ask for them on the rider. We don’t bring our amps with us, we just bring our pedals and guitars when we play fly dates. Where a lot of times on a bus, we’ll have our own amps, and I have an older AC30 that I really like. I like the reissues up until about 2006, and through the 90s. I like those reissues. It’s called AC30, TB model. These are the new models, and right here that they got for me, but they’re good too. John Scofield has two old Sundown amps, each one with a 12-inch speaker. He used these amps on albums such as Time on My Hands, Meant to Be, and What We Do. Sundown amps were made by Dennis Kager, but are now out of production. 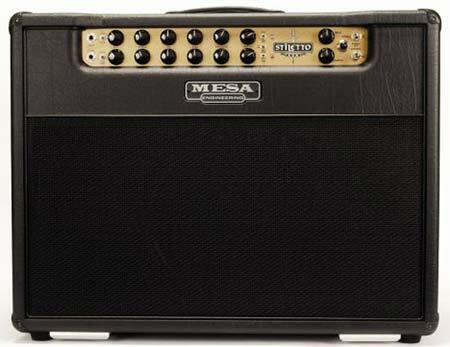 The Mesa Boogie Mark I Reissue is a 100-watt guitar amp with a spring reverb and a 12-inch speaker. Mesa Boogie Mark III with E/V speakers. Matchless Chieftain 2×12 Combo Amp. John Scofield has a large effects board, but only uses them occasionally to create specific sounds. His pedalboard is custom-made by pedalboards.com. Another pedalboard is done by Mason Marangella at Vertex. Most of the time it’s just his guitar going through the amp, even the distortion. 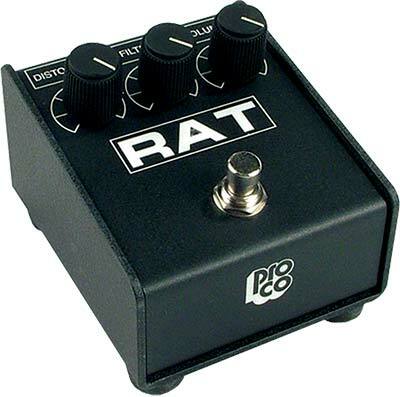 The RAT is a distortion pedal designed by Scott Richard Burnham who started ProCo in 1975. Scofield uses it to fatten up his sound. He uses just a little bit of distortion, but with the tone (filter) knob all the way up. He has 6 or 7 of the older RATs. Bill Frisell also uses the RAT. 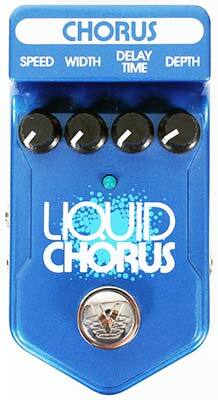 John uses the Ibanez CS9 chorus pedal with both controls cranked open to get a typical Leslie effect. This modeler has a collection of vintage filter and monophonic synth effects. 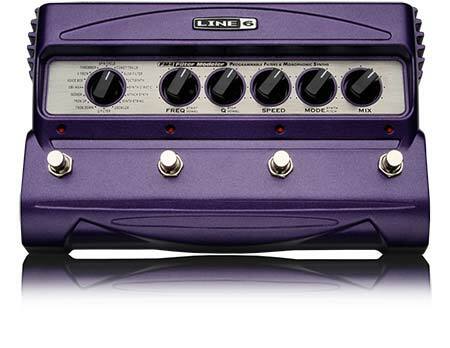 John uses the Line 6 expression pedal to control his line 6 gear. The Line 6 DL4 is a digital modeling pedal based on 15 vintage delay and echo effects. 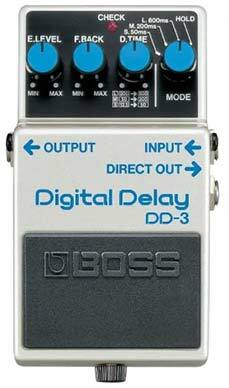 This delay is also used by Bill Frisell. Vertex-modified Boss GE-7 Equalizer. This effect is used for a dirty rhythm guitar sound with a lot of treble. Vertex-modified Boss CE-3 Chorus. the rate and depth are turned up all the way for a kind of fake Leslie sound. Single output buffer/splitter, splitting mono signal to two amplifiers. 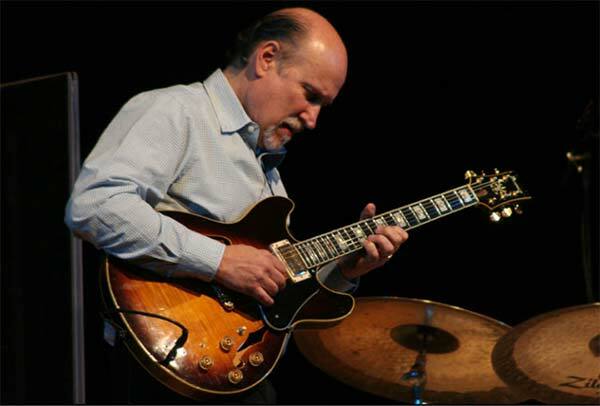 John Scofield exclusively uses D’Addario strings. 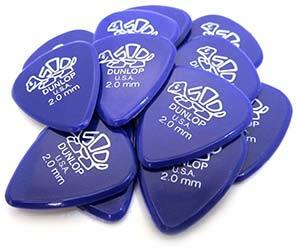 John Scofield uses Dunlop Delrin 500 2mm picks. Kenny Burrell is a legendary jazz guitar player who is known for his recordings on the Blue Note label. His main influences are Charlie Christian and Django Reinhardt. Kenny Burrell played in Dizzy Gillespie’s sextet when he was 19 (in 1951) and is the only guitarist to have recorded with John Coltrane. He recorded 108 albums as a bandleader and has played with jazz legends such as Billie Holiday, Louis Armstrong (on acoustic guitar), Chet Baker, Bill Evans, Stan Getz, Jimmy Smith, Wes Montgomery, Benny Goodman, and Oscar Peterson. In the late 50s, Gibson designed an L-5 for Kenny Burrell with a Florentine cutaway. It was equipped with a Charlie Christian bar pickup. Gibson made me an L-5 with a deep cutaway in the late ’50s. They did it reluctantly. I played that guitar for a while, but it was too heavy. The Gibson Super 400 has been Kenny Burrell’s trademark guitar since the 60s. He likes the body size (18″), the Florentine cutaway, and the humbucker pickup because of its low noise when he has to turn the volume up. Before finding this guitar, Kenny used a Gibson Super 400 with a Venetian cutaway and a DeArmond pickup. I prefer the Super 400 model with two humbuckers and a Florentine cutaway. With that cutaway, I can get my whole hand up there. The action is set lower on the bass side. He uses foam in the body of the guitar around the upper f-hole to reduce feedback. He also uses a surface plug on that f-hole for the same reason. He screwed a piece of plastic into the top of the guitar to keep the bridge from moving. The plastic is covered with a piece of tape. He installed tuning keys with peg-winder handles. D’Angelico New Yorker – the guitar used on the album with John Coltrane. Gibson L-7 – with a Charlie Christian pickup. Wes Montgomery borrowed this guitar to record his first album (The Wes Montgomery Trio) on Riverside Records. Gibson ES-175 – Kenny Burrell’s blues and rock guitar used for studio sessions. He uses the bridge pickup and light-gauge strings for bending. He is not a big fan of ES-175 models because they are too small and uncomfortable. Heritage Super KB – This Kenny Burrell Heritage signature guitar is based on the Gibson Super 400. Kenny Burrell was one of the first to use a Fender Twin Reverb. I like a fat, warm sound, so I set the treble low, the bass medium, and pump up the middle. 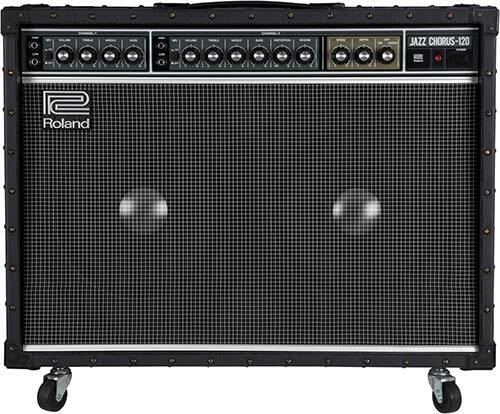 Kenny Burrell sometimes uses a Roland JC-120 as a substitute for the Fender Twin Reverb. Polytone – Kenny uses an old Polytone amp when he doesn’t have to play loud. 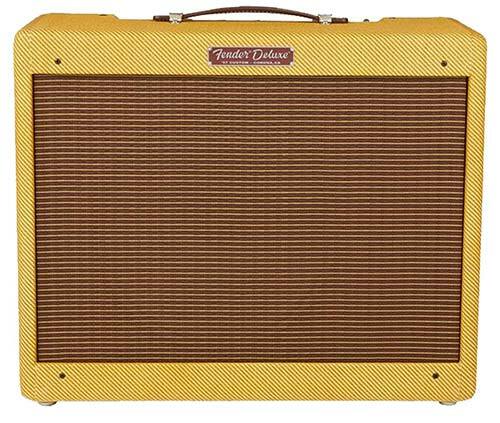 Fender Tweed Deluxe (Fender 5E3) – Wes Montgomery borrowed this amp to record his first album (The Wes Montgomery Trio) on Riverside Records. Fender Hot Rod Deluxe George Benson – for smaller gigs. Larry Carlton, who goes by the moniker “Mr. 335”, is famous for his studio work with Steely Dan and Joni Mitchel. He played on 100s of gold records and is proficient in a wide variety of styles, going from pop to blues to bebop. This Gibson Es-335 is Larry Carlton’s main guitar which he purchased new in 1969. He did the majority of his sessions and solo recordings on his 335. The choice to get the 335 was actually a very practical choice for me and so know I play a lot of different styles of music and for me I wanted to get a guitar that could cover a lot of bags so I didn’t always have to switch to a bebop guitar for this blues guitar for that and this one covers most of the bags that I want to play or was called on to play. This is the guitar that got him his “Mr. 335” nickname. The 335 has Schaller tuners, a graphite nut, a KTS titanium bridge, and two Gibson 57 classic pickups. Larry has a second 1968 Gibson ES-335, which was given to him by a fan. On this one, Larry changed the pickups to a matched pair of 1961 Gibson PAFs. 1955 Gibson Les Paul Special in TV yellow – Larry used this guitar on tour with Stanley Clarke and Billy Cobham. Valley Arts T-style guitar – A guitar with a small neck, built for speed. It’s the guitar used on the song Emotions Wound Us from the album Last Night Live at the Baked Potato. 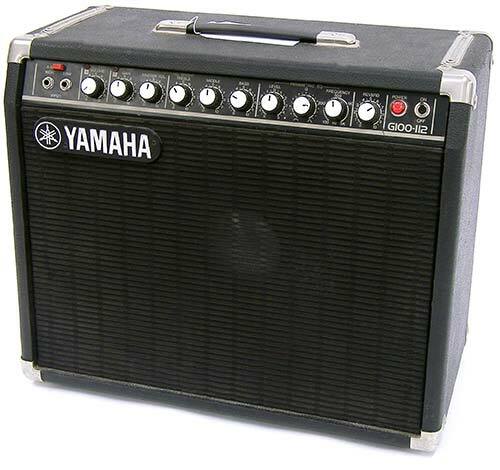 This is the amp Larry Carlton used for his Steely Dan sessions. He doesn’t use it very often anymore nowadays. The amp Larry Carlton plays the most is made by Brandon Montgomery of Bludotone. He uses a Bludo-Drive that has been modified to 50/25 Watt, plugged into a 1×12 Bludotone cab with an Electro-Voice EVM12L speaker. Yeah, you know it has so much what I call headroom that the transience just keep going through even when you play softly… and when I play harder it doesn’t compress like a lot of the amps will stop a sound, it stays open. Larry Carlton uses two pedalboards built by Rick Wheeler. I open my show with the Lord’s Prayer every night, and so I liked it to get the beautiful chorus going and some delay and really create a solo guitar atmosphere for the audience for the very opening of the show. So yeah, this has been clean and sounds wonderful. 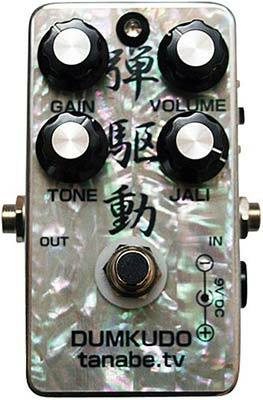 Larry Carlton uses this Japanese overdrive pedal when he plays on borrowed amps. It’s not as open as an amplifier would be but it doesn’t have any of the ugliness that a lot of other pedals have. TC Electronic TC 1210 – Spatial expander and stereo chorus flanger. Lexicon MX400 – Larry uses this effects processor for its reverb. Hilton Volume Pedal – Larry uses two of these custom-built volume pedals, one for eclectric, one for acoustic guitar. 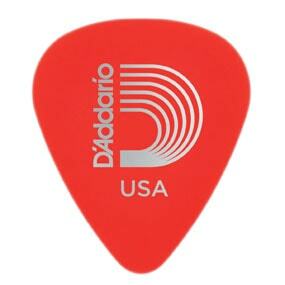 Larry Carlton uses D’Addario 010-052 strings for electric and D’Addario 011-052 strings for acoustic guitar. Larry uses a Fender-style heavy pick. He plays with the rounded edge, not the point, to get a better tone. Mike Stern grew up playing blues and rock on Fender Telecasters and Stratocasters, and he stuck with Tele-style guitars when he started playing jazz. Mike is faithful to his signature model Yamaha Pacifica, which is his main guitar, and his Boss effects, mainly the SD-1 distortion and two DD-3 Digital Delays. Mike Stern’s signature guitar is made by Yamaha and is a copy of a Tele-style guitar that was custom made by a friend of him from Boston, Michael Aronson. This Aronson-built guitar was, in turn, a copy of Mike’s original ’50s Telecaster which he got from Danny Gatton, who got it from Roy Buchanan. The ’50s Telecaster was stolen from him at gunpoint. The Yamaha Pacifica is Mike Stern’s main guitar. It is slightly different from the production models though, it’s made of heavy ash and has a darker sound. The guitar is equipped with a Seymour Duncan ’59 pickup in neck position and a Tele Hot Rail at the bridge. Mike Stern grew up playing blues and rock on Teles and Stratocasters, and he stuck with them when he started playing jazz. Mike used a Fender Stratocaster when he was playing with Miles Davis in the early 80s. Gibson ES-175 – Mike Stern used this guitar for a couple of years while studying at Berklee with Pat Metheny. Mike Stern uses two Yamaha G100-212 II amps paired with a Pearce G1 head going into two custom-built JBL 2×10 cabinets. He uses a Yamaha SPX90 as a splitter to run the amps in stereo, and also to create a chorusing effect by setting it on pitch change with a value of zero. Mike stern uses two Fender Twin Reverbs in stereo on the road, with a preference for the ’65 reissues. 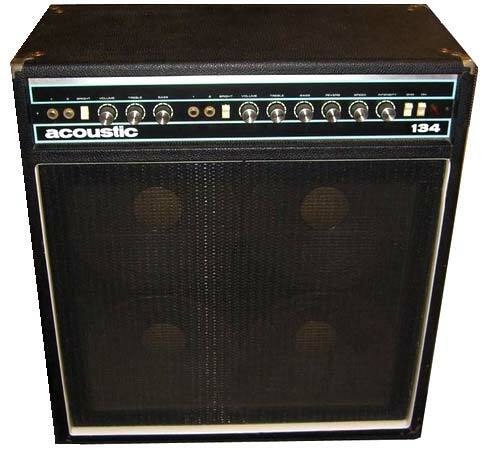 Acoustic 134 Model Amp – Mike used two of these with an MXR Stereo Chorus. Mike stern almost exclusively plays on Boss effects. 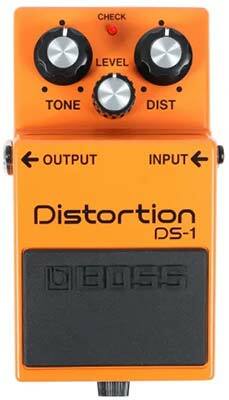 Mike likes the Boss DS-1 Distortion because it sounds organic. He uses it all the time. The volume is set a little higher than the clean sound. The Tone knob is set to about 11 o’clock and the distortion knob is set to 1 o’clock. Mike Stern uses 2 Boss DD-3 digital delays. One is always turned on with a short delay and little feedback, so it sounds like a reverb. The other one he uses for longer delays. The Boss SD-1 is an old school transistor type distortion with a wide range of sound possibilities. Mike’s Boss SD-1 has been modded by Robert Keeley. 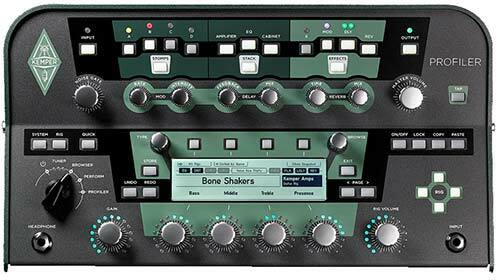 Yamaha SPX90 Digital Multi Effects Processor – Mike has this old Yamaha effects rack for the harmonizer patch only. He uses it to create chorus and splits the sound between two amps. D’Addario Nickel Wound Strings (011 to 038). Fender Original 150 Pure Nickels (010 to 0.38), but he replaces the high E-string with a 011. When Mike wants an in-your-face kind of feel, he uses the tip of the plectrum. When he needs a softer sound, he uses the side of the plectrum more. Sometimes, he uses his fingers for playing chords and tucks the pick into the palm of his hand. 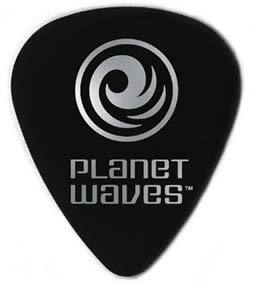 Planet Waves 1mm picks, wrapped in double-sided tape to keep his grip. Pat Metheny was one of the pioneers of using electronic equipment in his music and until now he’s always been looking for innovative instruments. The first ten years of his musical career he wouldn’t play anywhere without his guitar rig. He would not play unless he could use his own gear. That changed when he went on tour in the USSR and had to play on a Polish guitar. When he heard the tape the next day, he was surprised that his sound was there, no matter what guitar he played. 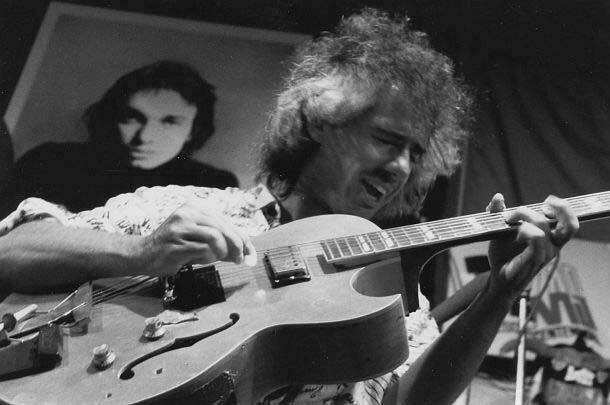 Pat Metheny used his Gibson ES-175 for almost 20 years. He bought the guitar at a garage sale in Lee’s Summit and he has been playing it since he was 13 years old. Pat made some modifications to the guitar, such as removing the bridge pickup and installing a Roland midi pickup. He uses a toothbrush in the guitar’s tailpiece to guide his guitar cable. Pat says he never had any repair work done to the guitar, although it was falling apart. To get the dark tone that he likes, he turns the tone control almost completely off. The Gibson ES-175 was and is very popular amongst jazz musicians. Some other guitarists that used an ES-175 include Wes Montgomery and Pat Martino in their early years, Joe Diorio, Jimmy Raney, Toots Thielemans, Joe Pass, Herb Ellis, Jim Hall, Steve Howe, B.B. King, Mark Knopfler, Keith Richards, Howard Roberts, and many more. The Ibanez PM100 is one of Pat Metheny’s signature guitar models and is his current main guitar. He started playing Ibanez somewhere in the mid-90s when his Gibson became too fragile to travel with. Pat Metheny owns a couple of PM100s, modified to his special needs. Besides the PM100 model with a natural finish, he also plays a black version (Ibanez PM100 BK). On the album Live -> Trio, he plays the prototype of the Ibanez PM120, which has only one pickup (the production model has two). Pat likes the fact that the tone control is more responsive compared to the Gibson ES-175. He doesn’t have to turn it all the way down to get the sound he likes. Pat Metheny uses the Roland G-303 guitar synthesizer controller 6-string in conjunction with the Roland GR-300 guitar synthesizer. 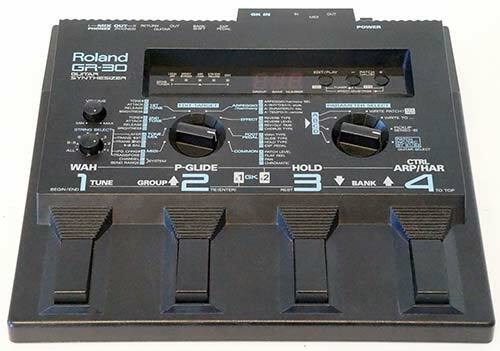 The Roland G-303 was made from 1980 to 1984 and was Roland’s most popular guitar synth controller. It is a high-quality guitar and doesn’t require guitarists to modify their playing style. Luthier Linda Manzer made most of Pat Metheny’s acoustic guitars in recent years. Linda is a Canadian luthier who met Pat over 20 years ago and has been building instruments for him ever since. According to Pat one of the reasons he began playing acoustic guitar is because of a 6 string made by Linda (called the “Linda 6” by Pat). The “Linda 6” is equipped with a Takamine pickup and was the guitar used to record Lonely Woman on the Rejoicing album. Pat also plays on a Linda Manzer nylon string, the Manzer Pikasso guitar (42-string), the Manzer Sitar, the Manzer Baritone, the Manzer flattop 12-string, the “Little Manzer”, Manzer “The Studio”, the Manzer Mini Archtop, and more. He owns 13 Manzer guitars in total. Gibson ES-140 (Pat’s first guitar, bought for $60 when he was 11 years old). Fender Mustang (Pat’s second guitar). Höfner Zoller AZ Standard (the guitar of his friend and Hungarian jazz guitar player Atilla Zoller). 1961 Gibson L-5 CES (this guitar was previously owned by Wes Montgomery, and later George Benson. It’s the guitar on the cover of Wes Montgomery’s album Movin’ Wes). Guild dreadnaught cutaway (permanently in Nashville tuning). Pat Metheny used this amplifier for 20 years, from 1974 to 1994. He describes the sound as flat, kind of midrangy-bright, but mellow and loud without any distortion. The problem was that this amp was really noisy and tended to break a lot. During his Joshua Redman tour, Pat realized he finally would have to modernize. He started trying everything and finally settled for the Digitech GSP-2101 preamp. With this preamp, he could get his sound, reliability and some bells and whistles (mainly programmability). Lately, Pat Metheny has been using a Kemper Profiler in combination with Bose L1 Compact System speakers. I’ve been using the Kemper for this last year and it’s been an incredible new development for me and my life as a musician. This has offered me a completely new way of getting my sound that I would not have believed possible and I’ve been having such a great time learning it as a new instrument. Ashly Mosfet 200 power amp routed to JBL speakers. Crest 6001 stereo power amp. The output of his Digitech preamp, just like the Acoustic 134, is connected to 2 Lexicon digital delays, one on his left at 14 ms and one on his right at 26 ms. Each delay has a slight pitch bend controlled by a VCO (sine wave), which makes his guitar sound chorused. It’s this ‘natural’ chorus that Pat is after since he doesn’t like chorus coming out of a box. The GR-300 is one of the first guitar synths (1979) and Pat Metheny was one of the first jazz guitarists who used it, in combination with the Roland G-303 guitar synthesizer controller. According to Pat, this guitar synthesizer was the first one that had a musical quality to it, it picks up every detail in terms of attack and dynamics. 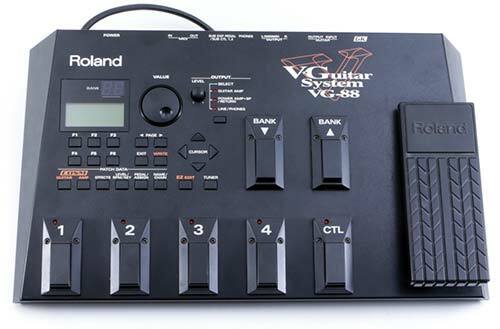 The Roland VG-8 is a guitar modeling processor that emulates the sound of popular guitars, amps, and microphones. It’s a combination of a pick-up installed on the guitar and a floorboard. Pat uses it to create synth-type sounds, on Imaginary Day for example. Pat Metheny uses light-gauge D’Addario strings exclusively. Wes Montgomery was not interested at all in guitar equipment, he saw his guitar as a tool to do the job. I got a standard box. I don’t never want nothing special. Then if I drop my box, I can borrow somebody else’s. Keep in mind that Wes Montgomery played with his thumb rather than with a guitar pick and this is a major characteristic of his guitar sound. It is commonly thought that Wes played with his tone knob rolled off. This is not true, he was always trying to get more treble from his pickup to compensate for the mellowness of using his thumb. Some sources say that his guitar amps were modified so they had a better response time. This is also not true. It is said that Wes never played unplugged. This is also not the case, he practiced unplugged a lot. 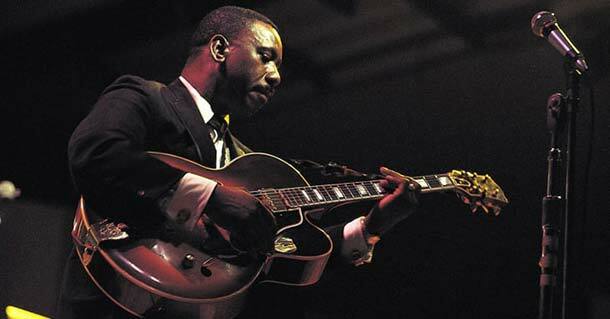 During his entire career, Wes Montgomery played almost exclusively on a 1963 Gibson L-5 CES (cutaway electric Spanish). Gibson produced this guitar since 1922 and is still in production today. It was the favorite rhythm guitar in big bands. The L5 was the first Gibson guitar with f-holes. Gibson made 3 custom guitars for Wes Montgomery, but they only had 2 differences compared to standard L-5: 1 pickup instead of 2, which was placed upside down. Other guitarists that use the Gibson L-5 are Tuck Andress and Pat Martino. Wes Montgomery played a Gibson L-7 on the recordings of The Wes Montgomery Trio (1959). The L-7 was loaned to him by Kenny Burrell, together with a Fender Deluxe amp. Gibson L-4 with a Charlie Christian bar pickup. Gibson ES-175: this is the guitar he is holding on the cover of Movin’ Wes. Wes Montgomery used a Fender Super Reverb in his early years. This tube amp has 4 10-inch speakers. In his later years, Wes Montgomery played this Standel amp. The Super Custom XV has 2 channels, a normal one and a reverb/vibrato one. The amplifier has 70 watts RMS and a JBL speaker. 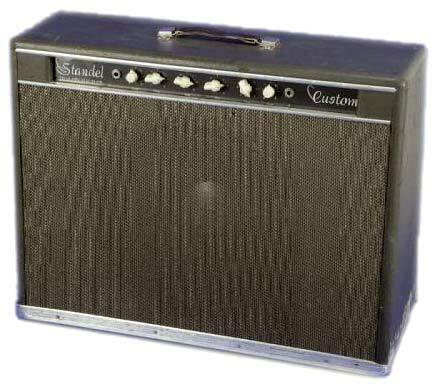 After the Standel, Wes played on a Fender Twin Reverb. Wes Montgomery used Gibson HiFi Flatwound strings on his guitars going from 014 to 058. Wes Montgomery didn’t use picks, he used his thumb for picking. He once tried using a pick for some weeks, but it never produced the sound he liked, although it enabled him to play faster compared to using his thumb. He used the fleshy part of his thumb, not his nail, and played only down strokes for single note lines and up- and down strokes for chords. Wes had a corn on his thumb. One sound he got from the soft parts of his thumb, another more edgy one from that corn. His thumb was double jointed, he could bend it all the way back to his wrist. Very interesting article, still as confused as ever. I have played jazz for 50 years+ and concentrated for far too long on mastering technique. Now I want tone. Head room with little or no distortion, some reverb and chorus. I also want compact and light weight. Doesn’t everyone?